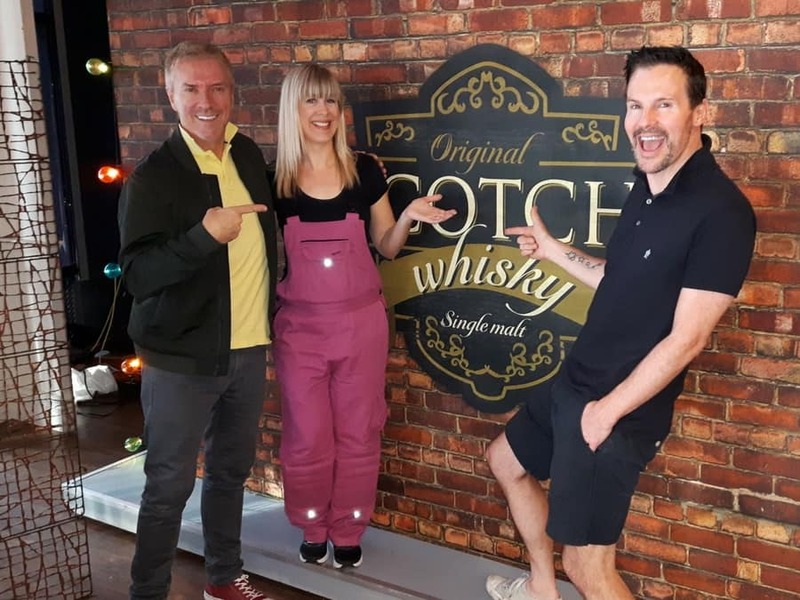 I’m excited to share some behind-the-scenes pics of my brick wallpaper on Cityline from Colin and Justin, so that you can see the cozy and warm space they created. Here’s the brick wallpaper Colin and Justin used without any furniture in front of it. Your eye doesn’t see the same pattern happening over and over like with some wallpaper. That’s called a repeat pattern and my wallpaper doesn’t have it. It’s because it’s actually a wallpaper MURAL. 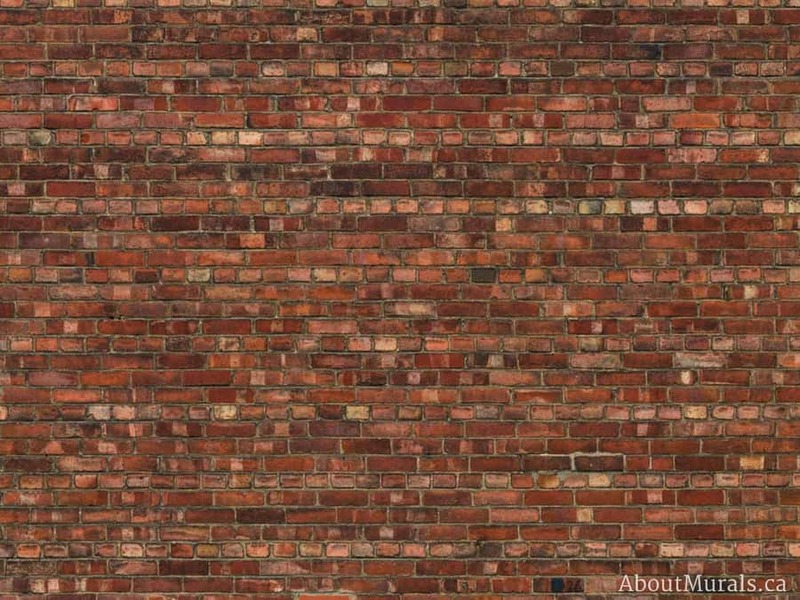 A photographer takes a high resolution photo of an actual wall – making a design that looks totally realistic. 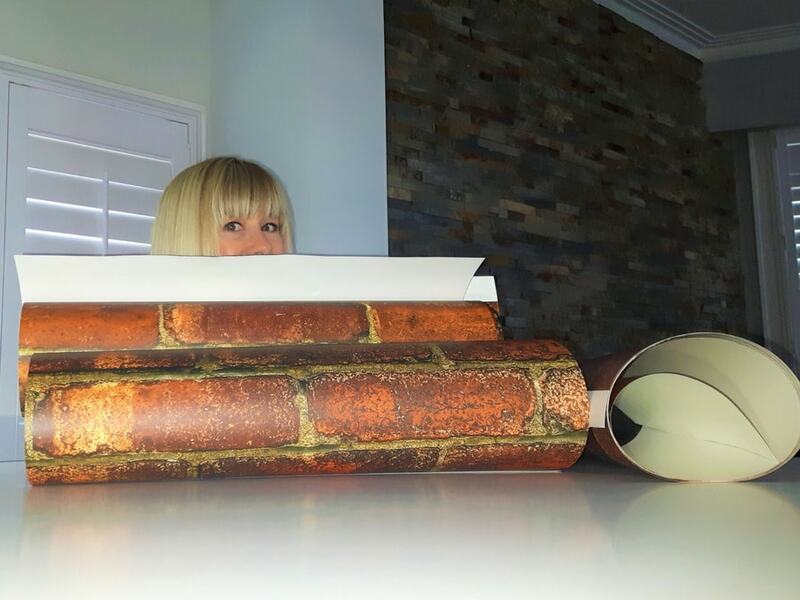 Did you hear Colin and Justin talking about the “textural relief” of my brick wallpaper on Cityline? Wanna know why it’s so crystal clear? The photographer takes 72 small, individual photos of each section of the brick wall and then stitches them together in Photoshop. This creates a super high resolution image that’s perfect for large scale printing. 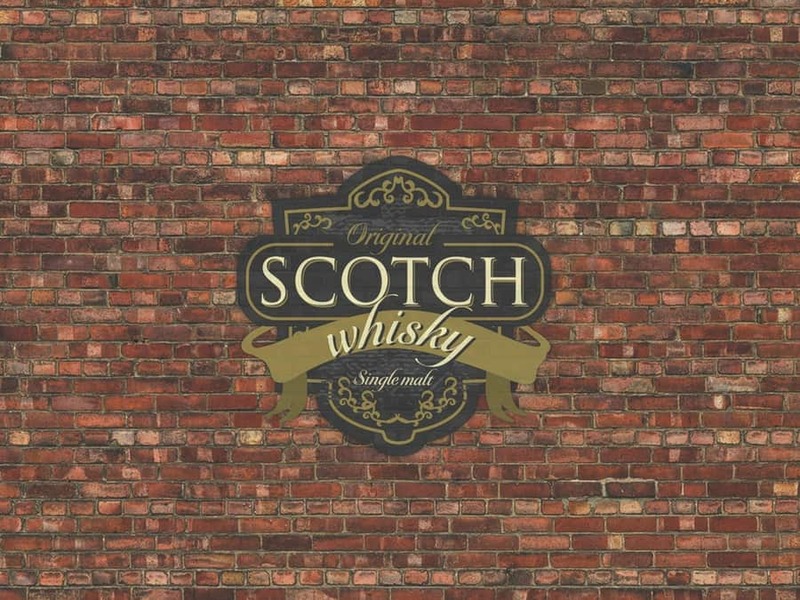 On top of the brick wallpaper, they needed to add a whisky label…so this was a custom wallpaper job (which I offer to all my customers). The label is actually hidden behind the tapestry on the show. 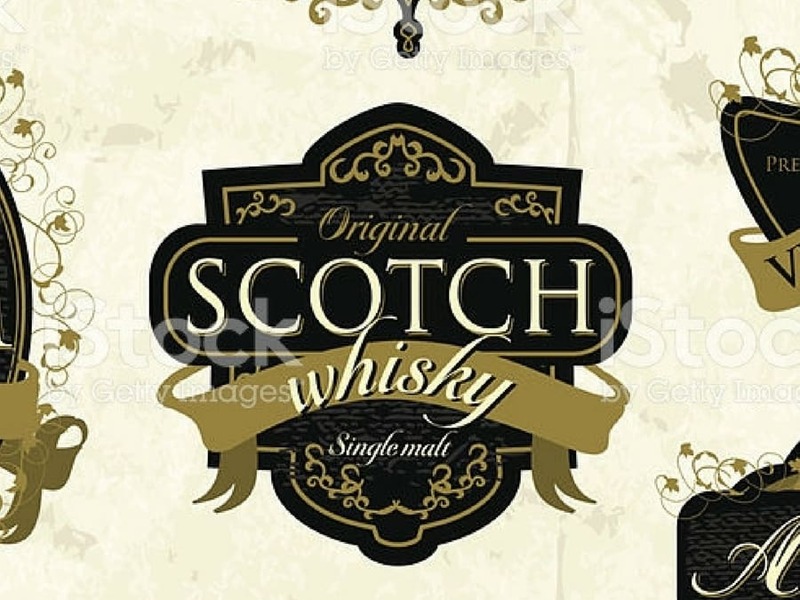 But they used the whisky label for another project they were working on, as well. As an approximate cost, a custom wallpaper is $5.50 per square foot – but there’s some intricacy to calculating it – so it’s best to gimme a shout for a proper quote. Since TV works fast, the boys didn’t have time to wait for a wallpaper sample to arrive, so they approved it from their computer screens (from the image above). But you can buy a wallpaper sample from any standard in-stock mural, like my brick design, right from my website. If you order a custom wallpaper, samples are also available. It’s quick and easy to hang! 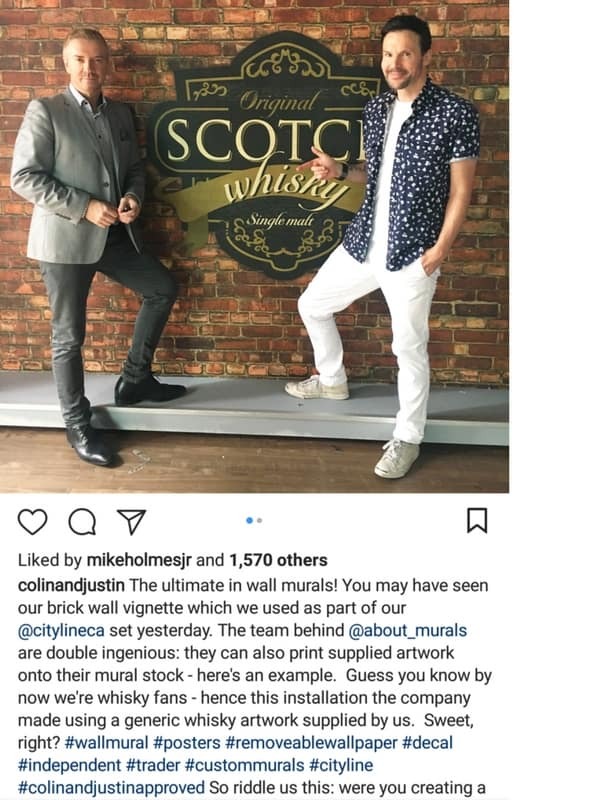 I hung the brick wallpaper on Cityline – in fact, I always hang my wallpaper murals for Colin and Justin when we work together – BUT my wallpaper murals are so easy to hang, most of my customers do it themselves. I even made a how-to-hang-it video to help my DIYers out. Of course, if you’re not into this type of project, there’s always help! If you live in Southern Ontario, I offer installation services. If you’re elsewhere, check out the Wallcovering Installers Association for someone in your area. The Cityline designers put so much work into these sets (and they always look fab), but the walls get dismantled as quickly as they’re created. That’s why my wallpaper murals work so well for TV (and your home, too) – they’re totally removable. So the next designers can come in, pull the panels off the wall and start fresh. So, what do Colin and Justin think of me? Check out their Instagram Post! And this sweet email they sent. Awww! Why buy your brick wallpaper from me? Don’t take my word for it! 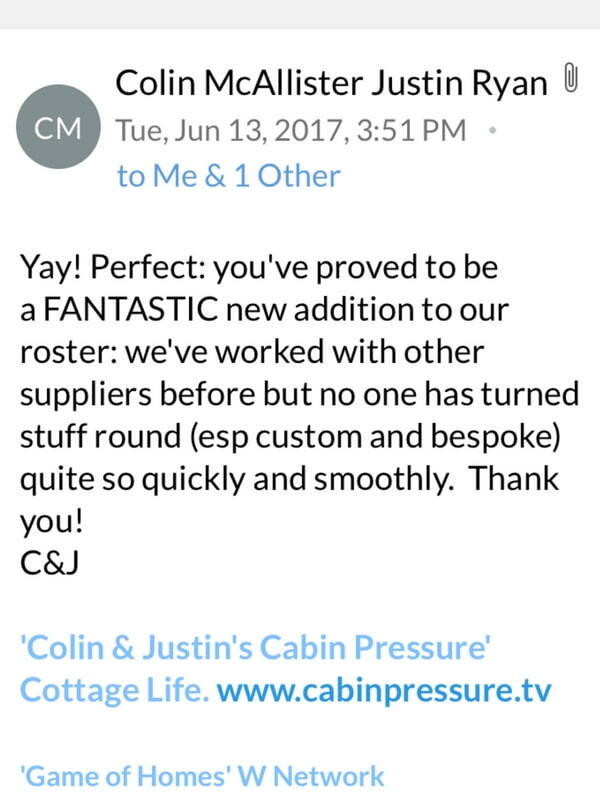 I’ve worked with Colin and Justin, Brian Gluckstein and the Mike Holmes Group. Do you LOVE a deal? Become a part of my newsletter community to get great deals, secret coupon codes and more inspirational pics of my client’s real life wall murals.